Lempicka was a female artist of the 1920s and 1930s. She was considered an Art Deco artist with soft Cubism. A strange combination, and her art is like no other, to my knowledge. I don't care for most of it, but one picture of hers totally captivates me, her self portrait behind the wheel of her 1925 Bugatti roadster. It commands cool, like cool should be. She is not only chic in that picture, but as in life, she is firmly in the drivers seat, a strong, but beautiful woman. She was ahead of her time. In a way, the Bugatti was a fashion accessory. The car doesn't command the respect it did then, but today it would nearly take a maserati or a Farrari to achieve the same effect. 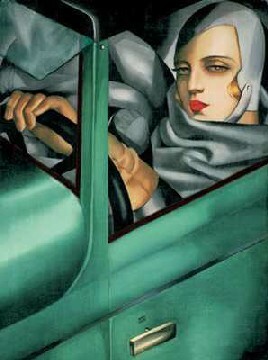 Anyway, what do you think about Lempicka's art? It's not the style I'd collect, but it's not bad at all.